During the week of September 14th to the 18th 2009 I travelled from Lambertville, New Jersey to Lebanon, New Hampshire. This also took me through New York State and Massachusetts, possibly Connecticut as well. The drive is about 320 miles. I stopped at various stages and usually at gas stations and always at Starbucks. I delighted in placing poetry posters by New Zealand poets at these locations. I was always well received. The funny thing about it is that if you go in with a poetry poster, then people will always talk to you. They are always friendly. There’s a heck of a lesson in that. With me (for company) were poems by Janet Frame, Campbell McKay, Hilaire Campbell and Michele Leggott. By now I had an industrial stapler for the wooden lamp-posts and an endless supply of cello tape. I stayed in White River Junction in Vermont (a truly beautiful State) and used that as a base to cover the surrounding area. This area was Hanover, Lebanon, and a bunch of small towns (Plainfield, Cornish etc). These small towns have real character. Part of that character is that they always have community notice boards. Lebanon has some postering bollards and I placed poetry posters on them. I also made sure I covered the libraries in each town. In one library I was approached by a bloke who had seen a Hilaire Campbell poem up in a neighbouring town earlier that day. That made my day. He laughed about the poem the topic of which is Rubbish Collectors in Christchurch, New Zealand (“Love Those Legs”). Is this diplomacy at work? 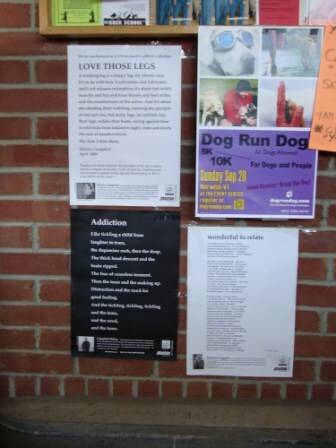 Dartmouth University is in Hanover and I spent a few hours there placing poetry posters. This is an Ivy League University and sure is big. The famous author J.D. Salinger lives in Cornish, New Hampshire and I was careful not to intrude on his privacy, everybody deserves privacy. His life is his life. Anyone who can write like him deserves honour in those around him. I did place poetry posters in the area including on the local convenience store’s notice board, and on the local town hall’s board. The convenience store is called “The 12% Solution”. I like that. It’s such a beautiful area. As I have said many times, I always enjoy a simple poster run and I always come away with the feeling that there’s something real about it. You can’t beat that in life.